While experimenting with plantain chips and garlicky guac (<- a must-try recipe, btw), I had a few leftover plantains and was up for some experimenting. Per usual, the big, wide internet didn’t let me down. And, in fact, it led me to discover that, among the many things you can do with plantains, you can make TORTILLAS with them. I know! It’s crazy. It’s magic. It’s delicious. Let’s do this! This recipe is so easy, requiring just 3 INGREDIENTS. Again, I know! It’s crazy! Next, to roll out, I went with tapioca flour to keep this recipe both gluten-free and grain-free. 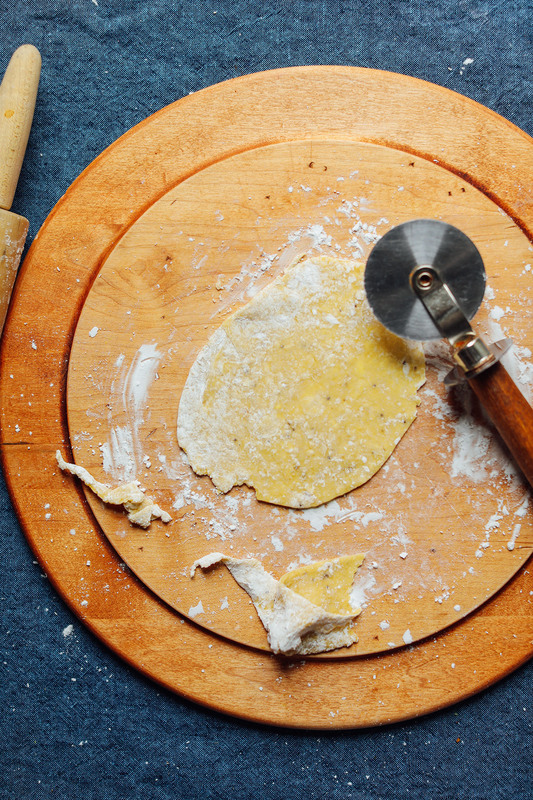 You can also try smashing the tortillas between wax paper or plastic bags, but I found this to yield super sticky dough that was unmanageable – tapioca to the rescue! All that’s left is a quick cook in a skillet (5-6 minutes total) and you have real-life tortillas on your hands! I know what you’re thinking – they are probably doughy in the middle and gross and not sturdy. But no! They cook all the way through, aren’t doughy in the slightest, and are SO sturdy I would bet money they’d hold more toppings than a traditional corn tortilla. These would make the perfect vessel for things like Vegan Barbacoa, Vegan “Pulled Pork,” Quinoa Taco Meat, Garlicky Guacamole, Roasted Jalapeño Vegan Queso, Saucy Portobello Mushrooms, and 10-Minute Chimichurri. I also bet they would work wonderfully for enchiladas (next on my list)! I also think, if baked, they would make a delicious tostada. Or, if sliced and then baked, they would make a delicious chip (see notes)! If you try this recipe, let us know! Leave a comment, rate it, and don’t forget to tag a photo #minimalistaker on Instagram so we can see your tortillas in action. Cheers, friends! 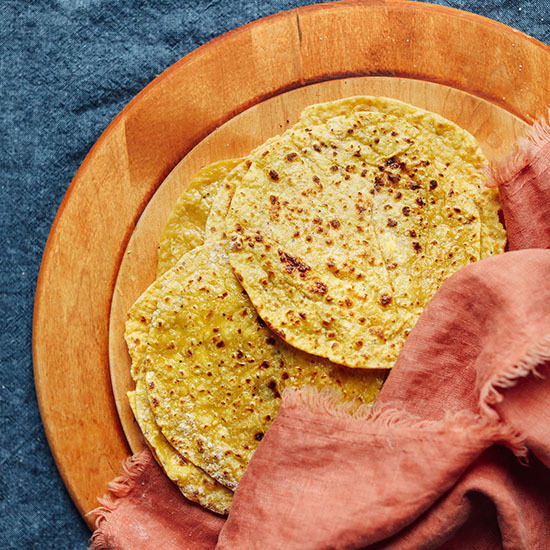 Amazing, 3-ingredient plantain tortillas! A delicious and simple grain-free option for Mexican-inspired dishes and more. Entirely vegan and both gluten- and grain-free. Slice plantains into 4 sections, and then halve those sections lengthwise (top to bottom // see photo). 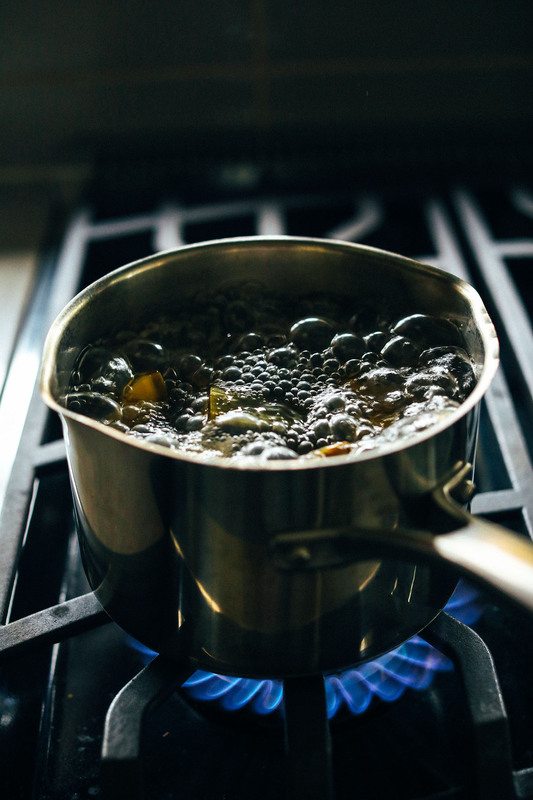 Bring a pot of water to a boil and add plantains. Boil for 15 minutes to tenderize the plantains. Then drain and let cool slightly. Peel plantains and discard the peel. 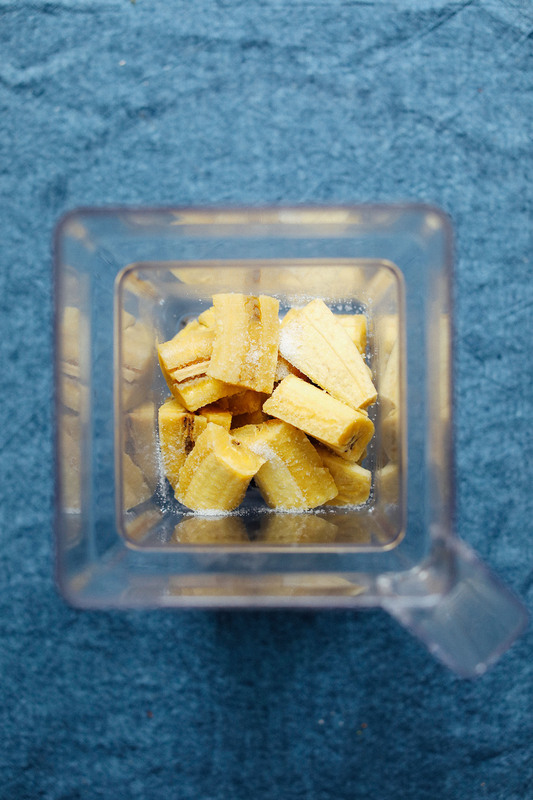 Then add the plantain and salt to a blender or a food processor. Blend until a ball forms (~30 seconds) - it will be sticky (this is normal). Dust a clean surface with tapioca and take small (~3 Tbsp) amounts of the dough and dust with tapioca. Dust a rolling pin with tapioca and roll out until almost paper thin (see photo). The dough is sticky so add more tapioca as needed. Repeat until all tortillas are formed (~10-12 as original recipe is written). Optional: you can use a knife or pizza cutter to make the edges a perfect circle, but this is optional! To cook, heat a large skillet over medium heat and lightly grease with coconut or avocado oil. Once hot, add one to two tortillas at a time (or however many fit comfortably in the pan) and cook until dried out and slightly browned on either side (~ 3 min per side). Continue until all tortillas are cooked (no need to continue adding more oil). See notes for baking instructions. 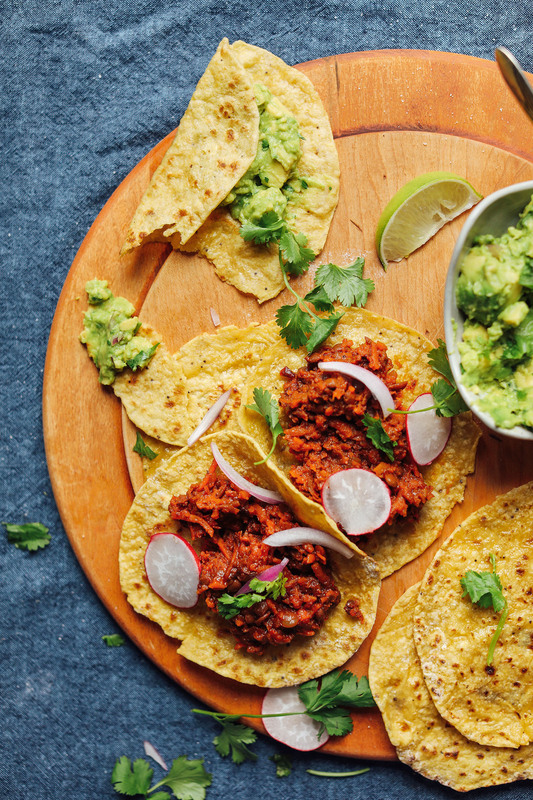 Enjoy immediately as a vessel for things like Vegan Barbacoa, Quinoa Taco Meat, Guacamole, and more! Store cooled leftovers covered in the refrigerator up to 3-4 days (though best when fresh), or in the freezer up to 1 month. If frozen, thaw before use. Heat in a 350 degree F (176 C) oven, or on the stovetop. *If baking, bake on a parchment-lined baking sheet at 375 degrees F (190C) for 10-15 minutes or until dried out and slightly crisp on the edges, flipping once to ensure even baking. I also think if baked until very crispy, they would make a delicious tostada. Or, if sliced first and then baked, they would make a delicious chip (as long as they are rolled thin enough)! Alternatively, you can make plantain chips this way! *Recipe heavily adapted from the talented DoYouEvenPaleo. 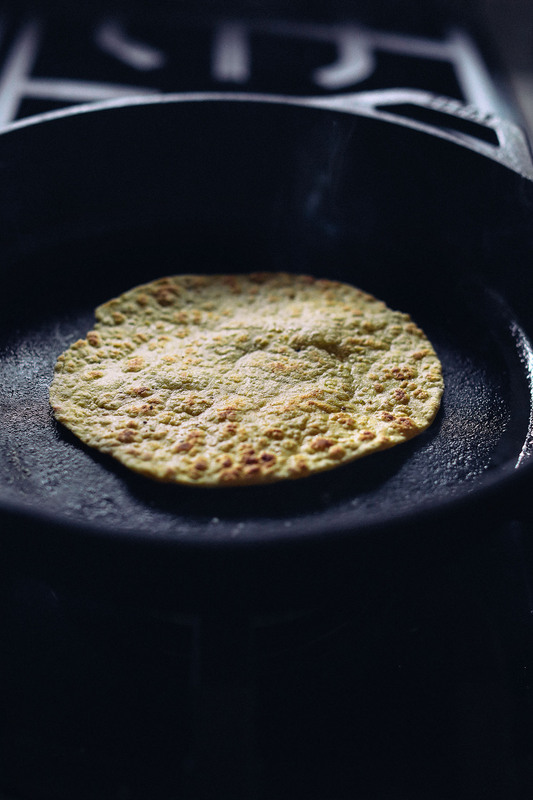 These tortillas taste even better than corn tortillas! Thanks for the great recipe! Thank you for this! Such a simple recipe. Made this today, mine looked nothing like your’s but they were yum!! These came out awesome! I am so happy I finally have something to satisfy my bread craving! So easy to make! Was just curious if anyone used a tortilla press and tht worked?? Thank you for your input. I read above. Sorry for the question it was already answered above. I will b trying these soon. These are LEGIT. I have been struggling to find an EASY recipe for torts. You could dress them up with spices but they are great as is. I make a double batch and eat them for a few days. They are best fresh but the next day I warm them up in the microwave at work and they come out just fine. It is great eating a tortilla that has familiar fresh ingredients instead of packaged ones with all the additives and ingredients that you cannot pronounce! I highly recommend these! Would green banana flour work instead of plantains? Would cassava work instead of tapioca? These are amazing! This is super simple, delicious and life changing. My family LOVED these! We eat Paleo but cannot have eggs, so we are constantly on the search for good alternatives. This is yummy and was a hit with my toddler boys! My only comment is that I saved making these until I was finishing a fish taco recipe on the stove. These needed too much attention to make them alongside the rest of my dinner. I will make them ahead next time and maybe keep them warm in the oven. Mouths were happy with dinner, but my kitchen was a complete and utter disaster from making these. They may be 3 ingredients, but they do make a mess. :) Oh, and I do keep avocado oil in a spray bottle for myself, and I ended up using this between each flip of my wrap so it could help cook up the white tapioca flour. I had a bit of a difficult time getting that to absorb in from my cutting board. Made with green [unripe] banana’s. Came out great! Found this recipe today and made it for dinner! It’s absolutely wonderful, thank you for this recipe! Also tried out the barbacoa, which is stunning too! Will definitely be making these again. I have made these twice now. The first time I baked them and they didn’t turn out very well. They were ok fresh out of the oven but they got very hard and chewy in the middle after being in the fridge. However, the second time I fired them in a little avo oil and they were hands down the best tortillas I have had. They are soft but sturdy. I added a little garlic to give it some flavor. I just want to get them out of the fridge and eat them plain as I’m writing this. Thanks for the recipe! After being on the AIP diet for a year I was longing for something bread like again. Just made these tonight! Very easy directions to follow. We used them for our chicken tacos and they were pliable, soft, and sturdy. Thanks for the recipe! Will definitely make again. I have made these before and decided to add a little shortening and a dash of sugar. I truly missed the sweetness of the corn. It made them even better than corn tortillas. Since I am allergic to corn, it was great being able to have that wonderful flavor again. I will definitely try this with the tapioca instead of the shortening (much healthier). Thank you so much for sharing this! I LOVE these!! I added almond flour directly to the food processor and fry them in a bit of ghee. I also freeze them and they thaw and reheat beautifully. Thank you for such a great alternative to corn tortillas!! Fabulous recipe! Better than corn tortillas and very easy to make. I added finely diced onion and a bit of chopped cilantro and a squirt of lime juice!!! Thanks. Sorry forgot to rate it. These were hands down the best paleo tortillas I have ever tried and I have tried a few recipes. I subbed cassava flour (Otto’s) instead of tapioca flour and I used just a little less than a quarter cup. I put the flour in the food processor with the plantains to make a less sticky dough. I pressed the tortillas with a tortilla press between 2 sheets of plastic and fried them in a dry cast iron frying pan. PERFECT! Far less fidgety than cassava flour tortillas. I’m going to cut and fry the left overs in a little avocado oil tomorrow to see what they are like as tortilla chips. Thank you so much for this recipe. I will be making it often. Hey! :) Thank you for this great recipe! I just found ripe plantains and would like to do it with chickpea flour, would this work too? Bump…this was my exact question! I have chickpea flour on hand and would like to use it! We haven’t tried and can’t say for sure. If you try, report back! I have 4 lbs of organic green banana flour. Has anyone tried making tortillas using this flour? I made this recipe for dinner tonight, easy to make. Just wish I had a roller! Used fingers for now, turned out great ?? Thank you!! Great flavor and easily to adapt for different culture tastes. We had them as ‘flat breads’ and as ‘taco’s so super versatile. Only difference I would make…slice the plantains down the length on both sides to peel, cut into the sections and then cook in boiling water. We will be making these again and I’ll be sharing it with my clients! Thank you Dana for this recipe! I made them yesterday and instead of using tapioca flower I used cassava flour and the result was great! From now on this are going to be my go to gluten free tortillas. My “dough “ was super super sticky. Do you think I boiled too long? Also I thought they had somewhat of a bitter taste but my daughter that is 3 gobbled then up. Did anyone else find them bitter or was it me? I’m curious about putting some flour in with the dough while blending to see if that helps bc I struggled to roll them. They stuck but when I added too much flour they cracked. Based on others reviews it seems I have done something wrong or just really stink at this lol. Oh I cannot thank you enough for this recipe! Being newly GF/DF with a 4 year old mini me who is also, this is a life saver. I’m easy to please…Her not so much, understandably. She hates corn and all GF tortillas and boom, tried this out and she asked for seconds! And it eases my mind knowing she is eating something good for her ? Next batch, I’ll cut down on the salt a tiny bit since my other two kiddos said they prefer less salty. I am in heaven! The best Tortilla since long time! Thank you sooo much! I can’t stop eating them. I was very pleased to search out this net-site.I wished to thanks in your time for this wonderful learn!! I definitely enjoying each little bit of it and I have you bookmarked to check out new stuff you blog post. These are so good! Make them! Cannot say enough good things about this recipe! It was so easy to make and the dough was easier to work with than I expected. I did use Tapioca starch but also put between two pieces of parchment. The wraps are soft and flexible and do not fall apart! Stuck them in the fridge overnight, warmed for about 30 seconds in the microwave then put almond butter on it for a breakfast roll up. I am going to try cooking them in the oven in a muffin tray to see if I can make little fillable cups out of them. So grateful for this recipe as I have so many food restrictions. This is something I can make a batch of and freeze and bring along when I travel or go to a friends house. Thanks Dana for your recipes, for some of us it really means so much more than just food. The kindest! Thanks for sharing, Sue! I’m so happy to now have a cheap, easy, and delicious tortilla recipe that isn’t flour or corn based. The recipe made 7 tortillas for me, and they weren’t quite as pretty as the pictures, but they sure were tasty, and sturdy enough to take my overstuffing of the taco (quinoa taco meat btw). Will Make again, and again and again! I made this with Garlic, Italian seasoning and sun-dried tomatoes in the dough. Instead of tortillas, I made lasagna noodles out of it. Used some homemade macadamia nut ricotta and meat sauce…and BAM! Paleo lasagna was born. It turned out delicious. Thank you for such a great recipe. Great idea’s!!!!! I will steal them for sure! Has anyone tried a sweet/dessert recipe for these and recommend? ** I refrigerated some boiled plantains that I did not have time to blend and make into tortillas after doing a batch– Chilled, they didn’t pull together well. Wonder if reheating to boiled temp, then slightly cooling again would have helped, or not? – warmed a bit, but also attempted to make dessert empanadas — used too much clove/allspice.. with a touch of butter flavored Olive oil… didn’t quite turn out as desired– will have to play more and measure spices better. usually eyeballing doesn’t steer me too poorly.. in this case… I don’t recommend. Made these last night… AWESOME! Held together PERFECT & GREAT Flavor. Very forgiving. Seemed like mine were dry while I was working on other things letting it cool. Used liquids from roasted tomatillo/peppers/onion and it balled up like dough would and formed perfectly. Made the Chimichurri sauce- OMG- WONDERFUL- I think I got the wrong type of parsley (curly & Thick) and just used less (maybe half)-half avocado- and it still tasted Superb. Made the Taco Seasoning, but used it on Chicken – only because I didn’t have time/energy left to do Quinoa. Need to invest in tortilla press- I used plastic wrap in between a wooden cutting board and stood on a cast iron pot. Got them maybe 1/16”.. .like thinner a LOT.. and they held together AMAZING… no tears AT ALL! Could I sub in cassava flour? Do you think the amount would need to be adjusted? Hubby and I made the tortillas last night. We enjoyed them with the chickpea scramble, and YUM! These are way better than corn or flour tortillas, and so easy to make! No more store tortilla’s for me! weee, Thanks Dana. Made these tonight and I was blown away! From the romresco sauce to the plantain tacos, they were a hit! I will definitely be making these again. Your recipies are amazing! The plantain dough was a little sticky and all I had was some brown rice flour. Once I got a generous amount of flour on the dough, they rolled out without a problem. Cleaning the Vitamix was was another story(ugh!!!). All in all, GREAT RECIPIE!!! Thanks? These were amazing with the cauliflower romresco tacos. We were in heaven, and fighting over who would get the last one. Perfect tortillas! Will definitely make them again! Could I use potato starch instead of tapioca starch? Just curious! Hi Hilary! That should work! I made this yesterday with my daughter and I have to tell you, it was so easy and it turned out fantastic! They are perfect. I will be making these a lot. Thank you for the time you must of spent coming up with this recipe. You have made my gf needs easier to deal with and that has just made my year. Used this tortilla recipe for fish taco’s and used a gluten-free flour mix to roll them out. I am completely blown away by the result. It’s incredible! Thanks for sharing, this will become a staple now. I was born in a tropical country (Venezuela), we’ve been eating plantains every single day, but I’ve never tried them like that. Easy and delicious. I used green plantains. Five stars for this recipe! Nice recipe. I am from originally from Venezuela and we have “Tostones” and “Patacones” which are made out of pressed unripe plantain. They are so delicious but thicker than this. I’ll try this recipe, I am very curious to know how they taste in a thin Tortilla. Thanks for sharing : ) Love your site. I made these last night for a dinner party and served with Hawaiian Pulled Pork and it was so so good! Tortillas were sturdy, but also so tender and delicious. This is my new go to, I plan on making a larger batch next time (I doubled it last night already) and hopefully freezing them. So so good! Thank you! These were wonderful! I have tried making several different kinds and have spent a LOT of money trying to find a flexible and tasty GF/DF tortilla. Hubby and son are crazy picky! They were literally eating these tortillas as soon as they were coming out of the pan. My only modification, which isn’t really a big one…we live in a “tiny house” and I have very limited counter space…so I mixed the 1/4 cup GF flour IN the food processor with the plantains, as opposed to sprinkling a board….then I could just mash the mixture between 2 small pieces of wax paper (with a teeny spray of non-stick for good measure) with a roller. Zero problems making them and my whole first batch is gone (kind of bummed about that..was hoping for some leftovers) :) Thank you again! This was a good one! These tortillas are a game-changer!! My husband has a corn sensitivity and because of it we’ve had to cut out tortillas (SO sad). I can’t wait to try these. Thanks for sharing! Wow! Easy and delicious recipe! Thanks! These are amazing and so simple and easy. Best paleo tortilla substitute that I have made! These are delicious. I just made them for the first time and I am certain they will be a staple in my house. Thank you so much. Very easy to make. I followed the recipe exactly. My husband says you are a genius for creating this recipe. Theses were amazing! We want to quadruple the recipe so we have these on hand since we are taco freaks. 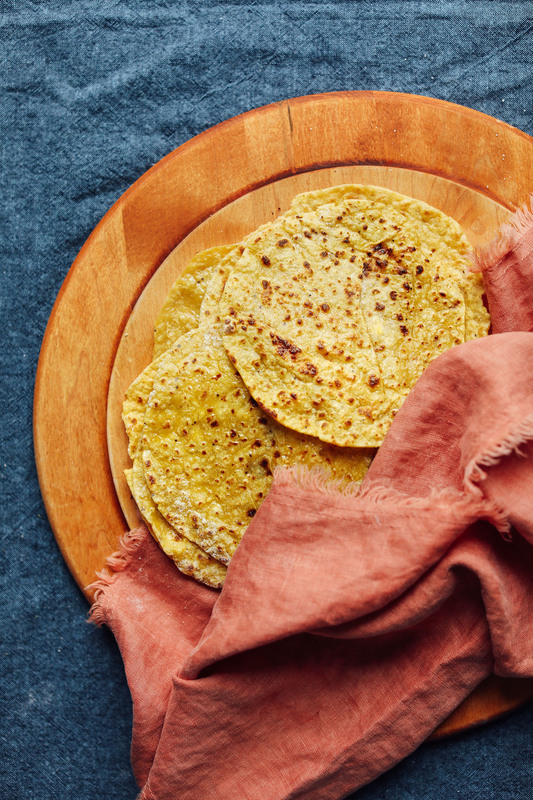 These are even better than corn and flour tortillas and so easy to make! There are no words. Honestly. These were phenomenal. Thank you for creating these! We have a few sensitivities in this house and living without tortillas or wraps has been hard. All of your incredible recipes have revolutionized our lives, thank you!! I love chips and guac so much and I am so excited to try this recipe!! I might have to try to squeeze it in sometime this weekend! Thanks so much for sharing, I have officially fallen in love with your blog! Made the plantain tortillas today. Excellent! Will make these whenever I need tortillas! Thank you! Made Cauliflower Sweet Potato Chickpea Tikka Wraps with Coconut Chutney to go with them. (veganricha.com) YUM. I am still struggling with the stickiness, but the ones I have been able to make are delicious. I will try them with guacamole. Dana, thank you for the fabulous recipe! I’m trying to stick to a real food diet (I.e. no vegetable oils) so I figured I’d give your recipe a try. I used whole wheat flour and it turned out perfectly! My 2 plantains turned into 8 tortillas and I loved that the taste was very neutral (I used them for grilled fish tacos and would use them with beef and chicken) and I was thrilled that they didn’t break when stuffed. I made these and they tasted great, but they gave me so much trouble. I boiled them for a little longer than 15 minutes, so either that wasn’t long enough or I don’t have a powerful enough blender like a Vitamix, because they wouldn’t blend up. I steamed them and that softened them enough to roll out but I used WAY more AP flour than the 1/4 cup tapioca called for (maybe ~2 cups?) and it took awhile to roll out. I’d like to try the recipe again because I liked the end product but it was more work than I was planning to do on a meal-prep Sunday. Wow! Just made these tonight and they were delicious! I’ve been wanting a healthy tortilla recipe for awhile, and these definitely fit the bill. You are a genius! Hi, these are sooooo delicious, amazing recipe, thank you! I have been gluten and egg free for three years, so I was so excited to see this recipe. I made them last night for chicken Caesar wraps, and it completely exceeded my expectation in every way! They were soft, strong, flexible, tasted very neutral. It was hands down the best flour-like tortilla I have eaten in years, and so easy to make. This will become a staple recipe in my kitchen for any kind of Mexican food, wraps, etc. Thank you Dana!!! Just made these tonight– super delicious! I tried both frying and baking to cook them, and both turned out great. I’d actually recommend baking if you want a more hands-off approach (they get crispy edges which are my favorite). I was amazed at how sturdy they were– didn’t break AT ALL even with lots of taco toppings! Will definitely make again! These look amazing!! do you think they would freeze well? maybe if I put parchment paper between each tortilla and then wrapped them in plastic? Hi! Yes you can freeze them! I made this recipe last night and my boyfriend and i loved it! This is amazing! I wonder if this would work as pizza crust. I would give it a try this week! pizza crust? great idea!!! have to try it! Just tried these out and they were great! Added a touch of garlic and cayenne for a little kick; may try cumin next time. My first green plantain experience! tge only downside was de-gunking my Vitamix afterward. ? making tortillas using another recipe, I was extremely hesitant about making this. To be honest the thought of using plantains didn’t sound appealing. I thought the taste would be too powerful and that it would come out a sticky mess, but it was anything but that! It was so easy, durable and DELICIOUS! Oh wow. I really feel these would be so great to make regularly!! Thanks for the post. I hope I can have them. I tend to react to bananas, but maybe plantains will not harm me….maybe I will ask my very dear Filipino friend if I could taste one of her plantains to see (she always talks about plantains). These were a much easier to make than I expected! They’re pliable, strong, and the best tortilla I’ve ever had, period! They were neutral-tasting so I think I’ll throw in some herbs and aromatics next time. I can’t wait to try these in different recipes! Okay, I’ve read the write up and the recipe and looked at the photo, but I’m confused. You slice they plantain *with* the peel on, then boil them *with* the peel on, then you peel them? I am missing the purpose off the peel being on, it why they need to be boiled in their peel. What am I not understanding? All your recipes are great, so I know there must be a reason. I just finished cooking my plantains. Unless you use a knife, you can’t get the peels off when they’re raw. After they’re cooked, I could easily take the peel off with my fingers. I’m guessing that’s the reason? Hi! The reason you boil it with the peel on is because it is easier to peel afterwards, it is difficult to do when the plantains are not ripe. Hope this helps, happy cooking! Thanks! Couldn’t figure that out, but it makes sense. Unripped plantains would be harder to peak. Once boiled the pile comes off easily. I live in Seattle, where can I find plantains here? I found mine at Whole Foods! Can you use regular flour or corn starch instead of the tapioca? It will affect the flavor, but yes, that should work. Thank you!! Can’t wait to try! Hi there. Would corn starch work instead of arrowroot or tapioca flor? That should work! And if not gluten-free, all purpose flour. Totally have the same question about using bananas. If they are still quite green, would it work in the same way? From my understanding, American is the only country that eats bananas ripe. Other countries eat them and cook them like one would make potatoes. And that’s why I think there is a good possility of bananas working. I honestly don’t think that would work because bananas are too soft, but if you try it let me know how it goes! We have a full stalk of bananas about ready to come down and I will try this with the green bananas which we use instead of potatoes, etc. I’ll report results. Aloha! After I saw your instagram post about these a while back I had to look them up and try them! They were so simple to make that after the first time we invested in a tortilla press from Amazon (well worth the $25.. we eat tacos at least once a week). I put just a liiittle bit of coconut oil on my hands before separating the dough into sections and it made it much easier to handle – I was able to roll out between parchment paper with no issues. I liked these better than corn tortillas and they do. not. fall apart! ? Whoops – I swore I clicked the 5-star rating when I posted my comment, but it didn’t show! Thanks, Dana! Did you try this in your tortilla press? If so, did it stick and how did it turn out? Instead of unripe plantain and then cooking it, could you just use very ripe and not cook it before blending? 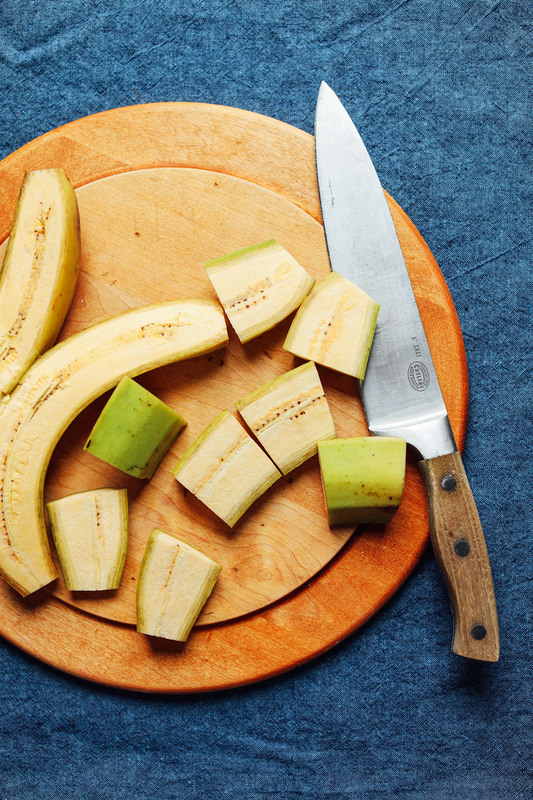 bananas don’t have to be cooked but plantains do, both green and yellow HAVE to be cooked. Just curious. I see that there are two 4 star reviews but both the people who did this Didn’t say anything about trying the recipe. Is that true or am I missing something? These tortillas far exceeded my expectations. I originally saw the recipe and thought “there is no way these are going to work…” BUT, I was dead wrong. My whole family loves them. We have made them multiple times and they come out great each time. This is a very simple, yet KILLER recipe! Thanks for sharing it! I tried this recipe with ripe plantains and the result was very different, it wasn’t like a dough but more like a pancake, thicker, creamier and sweeter. I really loved it! I agree, I thought my plantains were still fairly green but I got the same results – more like a pancake and sweet. I would suggest only very green plantains be used if you want a tortilla. And make sure you roll them very thin. This sounds so easy to do compared to all the other gluten-free tortilla recipes I’ve searched for! Will definitely be making these tonight!